On Thursday, we had the pleasure of checking out the latest designs by Mani Jassal. 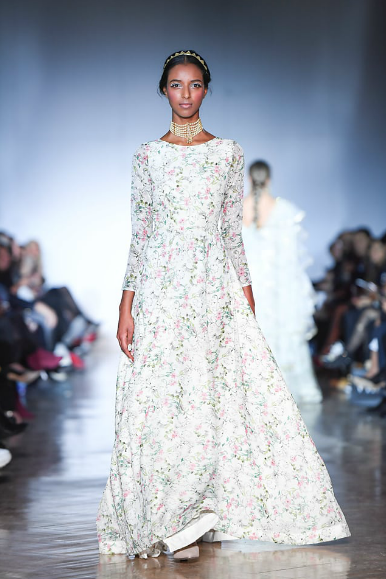 As part of Toronto Fashion Week x RE\SET, Mani launched her With Love collection on the runway at the Royal Ontario Museum, getting us hella-inspired by her fresh and sophisticated spin on South Asian fashion. 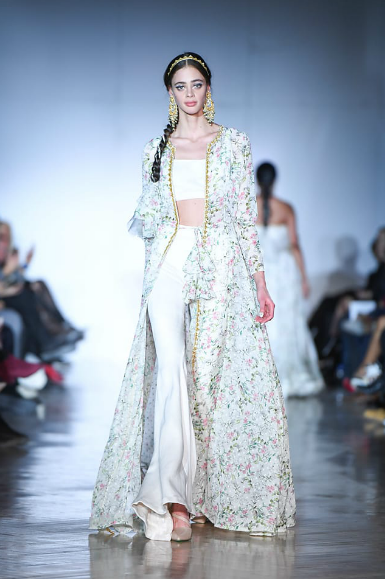 Mani Jassal is a luxury evening wear and bridal brand that was created in 2014 by Ryerson Fashion Design graduate, Mani Jassal. She was born in Punjab, India and moved to Toronto with her family at age 5. As she grew older, she started to take notice of the influences of culture and art and soon developed an interest in fashion. With a division between an ethnic and everyday wardrobe being a reality for many women, her brand aims to develop a community of style-seekers celebrating the many layers of their upbringing and identity (without sacrificing comfort and modernity). 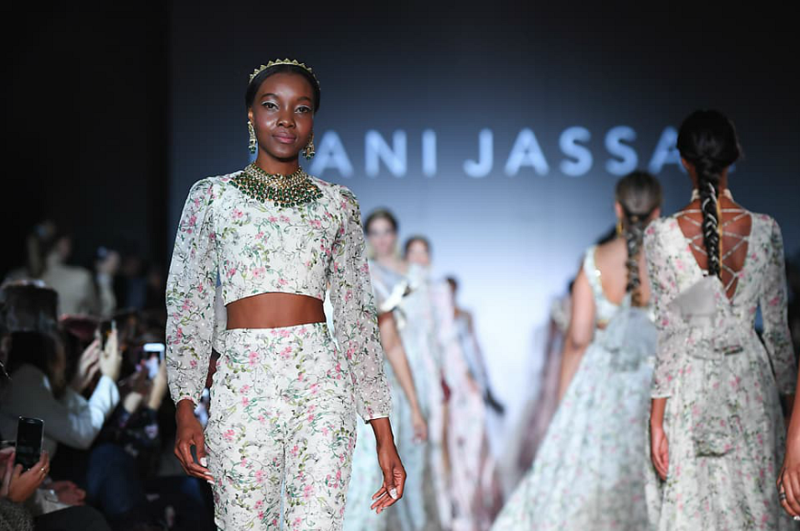 This isn’t Mani Jassal’s first collection to hit the runway at Toronto Fashion week. Her Garden of Desire | erised’ Spring/Summer collection in 2018 showcased striking pieces with Indian influences that can be worn for multiple occasions. She has developed 7 collections so far, ranging from bridal, evening, and ready to wear. This year’s made-to-wear collection was created in-house by a skillful all-women team, which she brought out with her at the end of the show for a well-deserved round of applause. It’s safe to say, we loved every single item in this collection- the darling floral prints, intricate embroidery and a light pink, white and beige colour palette. This year’s pieces truly embodied the spring season. According to the designer, the With Love collection narrates a ‘young love story through flirty details and light and flowy fabrics’. And girl, did it ever! Here are a few of our favourite looks from the show. As for the finishing touches, each look included long braids, dazzling drop-down earrings, ethereal crowns and shiny accessories that were made by the Mani Jassal team. The models wore strappy stilettos that showed off the length of the legs, enhancing the look of some of the high slit dresses. The makeup was on point with peachy cheeks and lips and an awesome white eyeliner that popped. After the show, I felt uplifted – like I had been a part of a kind of fairy tale experience. I was impressed with the prettiness of the Mani Jassal collection and felt the sense of empowerment emanating from the entire team, the models included. We’ll be sure to have the next Mani Jassal collection launch on our radar. In the meantime, I’ll be finding an occasion to rock one of these fabulous dresses myself! Want to shop Mani Jassal? Shop online or at the Mani Jassal showroom inside Yorkville Village (55 Avenue Road, Toronto). Appointments recommended. Follow @manikjassal on Instagram to stay on top of the latest!